say your house is on fire or there's a disaster,yet you only have time/room to save just one tf. myself,would be a toss up between g1 fortmax or mp-04. the reason for fortmax is because if anything,once everythings all clear and safe,i'd still have a giant chunk of plastic that's worth almost a grand in case of emergency. Definately my original G1 Powermaster Optimus Prime. It was my first TF, and one of the only TF's to actually survive my childhood. I'd make a grab for Predaking and Shockwave. Unfortunately Trypticon and Scorponok would perish. Thought to be honest I'd probably leave all my Transformers and take the 10 boxes of weapons instead. Getting the figures again would be easy. My choice would be similar to Otis's idea. 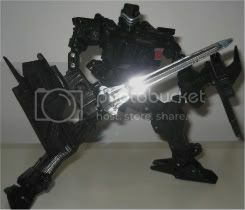 I'd save my BW:Animated Megatron (signed by DJW & David Kaye) . I could hock that sucker on Ebay & use the much needed cash. Kinda goes against the idea of "saving just one"
You know you're old when you feel the effects of inflation on food. You know you're an old nerd when you feel the effects of inflation on action figures. A small one, so the missus doesn't get angry / see it. Well you always go crazy and make the room with fire proof cabinets. Predaking. Is that 1 or 5? My Telemocha 10th Anniversary Beast Wars Dinobot.It was my first ever Transformers toy and this being my favourite character along with it being signed by one of my favourite Voice Actors of all time,it's something I can't part with. None...I have nothing in my current collection that I can't re-buy MISB with the insurence money. A fire would only purge my collection of things I don't really want or need and make it better all at the same time. I'd grab either the laptop or the our external hard drive....Pictures are worth more to us then any other possession. Ok if I had a few seconds and the wife wasn't looking...MP Prime or MP Grimlock which ever is closest to the door. I would probably perish in flames trying to decide!